Also available as an eBook in ePub, Mobi and PDF. This is an excellent book. The author has translated an extensive amount of work, and this is (in my opinion) one of - if not the - best book to describe the fundamental aspects of Buddhism. I've read and re-read the first copy that I purchase, so I gave it to my friend. A couple days later, his house was burned down and looted. I immediately bought a second copy to give to him, and he has started reading it. It has helped to support him during this difficult time. The Noble Eightfold Path is a way of living, a dynamic path which must be walked. Studying the path is not sufficient for reaching the final goal. This doesn't mean, however, that there is no value in study. To get the benefits which the path has to offer, it is necessary to understand the path. Only when we have a firm understanding of the path can we walk with wisdom. There are many books on Buddhism, and most of them deal with the Noble Eightfold Path. There is an extraordinary benefit in learning about the path from someone who is walking on it. A dry, removed, and academic treatment of the path may deliver the same information, but it doesn't do so in a way the inspires confidence and devotion. Bikkhu Bodhi's style is clear and concise. 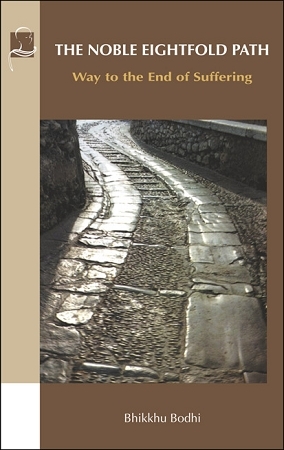 He writes as one who knows the path because his life is centered on it. He balances scriptural references with personal insights, and relates his wisdom to the context of modern life. The Noble Eightfold Path is organized by path factors, and each of the eight steps receives individual treatment. It's a short book, only about 120 pages long, but it's an excellent reference for meditators. Along with an analytical treatment of the path, Bikkhu Bodhi also delves into the Buddha's advice for challenges that come up during meditation. Bikkhu Bodhi explains how the path factors support one another, and how they fit into their larger groups: morality, concentration, and wisdom. In effect, the entire practice of meditation is examined in this book, but it does not purport to be a manual to teach meditation. It is most useful as a reference for established meditators or as a more in-depth look at the theory supporting meditation for those who would like to take up a practice. Bikkhu Bodhi himself intones that a book is no replacement for an experienced teacher when it comes to learning meditation. "Liberation is the inevitable fruit of the path and is bound to blossom forth when there is steady and persistent practice. The only requirements for reaching the final goals are two: to start and to continue. If these requirements are met there is no doubt the goal will be attained. This is the Dhamma, the undeviating law."